The Philippine version of Shangri-la, Sagada may not be Utopian but it is definitely remote and exotic. Located 275-km north of Manila (100-km from Baguio) near the provincial capital of Bontoc it's a long day's bus ride starting from the Dangwa bus station in Baguio over the narrow mountain tracks traversing the Cordilleras. 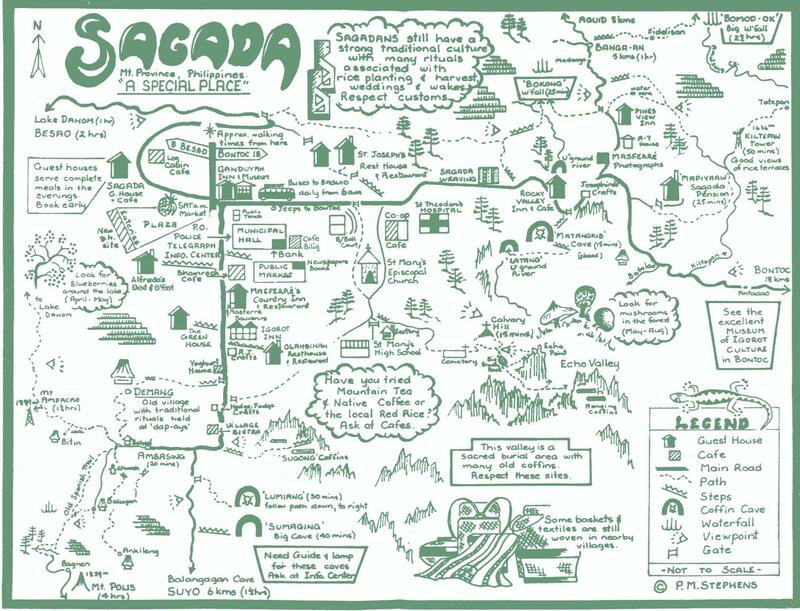 Popular as a destination of foreign adventurers, Sagada features caves that can be explored (even by non-experts) with the aid of local guides, an interesting hike along an underground river, a waterfall and pool to cool off in after a day of exploring, and a quiet serenity only found off the beaten path. The forebears of the current residents practiced an unusual burial practice by hanging and stacking coffins, hewed from tree trunks, in the limestone karst cliffs and caves near town. A nice place to stay is the St. Joseph's Guest House run by the nuns of an Episcopalian convent. They provide comfortable rooms, some meals, and help locate guides. From Sagada it is a short ride to Bontoc where you can catch a jeepney to Banaue and its famous rice terraces. At the Bontoc bus stop, visit the gift shop and pick up a few photos of the mountain tribes taken by E. Masferé. Once you reach Banaue, you might want to try hiking to yet another Shangri-la, with fantastic rice terraces, called Batad. More information about the northern provinces can be found in the travel section of Tribung Pinoy (link on home page).